Today we conclude our coverage of TEAM WEEK! Since his days of playing high school basketball, Ronnie Raymond has been a team player. Perhaps that is why he’s joined so many superhero teams! This week we’re looking at several of the teams he’s joined since becoming Firestorm! 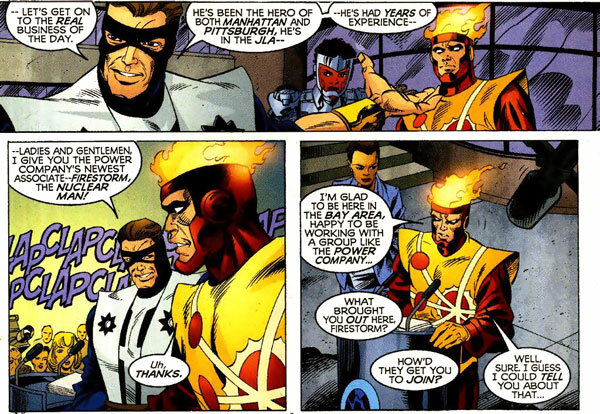 Yesterday we examined how Firestorm re-joined the JLA in 2002. Well, it turns out that while he was a member of the JLA, he was also moonlighting as a member of The Power Company! If you are unfamiliar with The Power Company, it was a team of professional superheroes-for-hire. They were structured in many ways like a law firm, including partners and associates. The team was created for DC Comics by writer Kurt Busiek and artist Tom Grummett. Two of my favorite creators in comics! I was sooooo excited when I heard Firestorm would be appearing in this book. 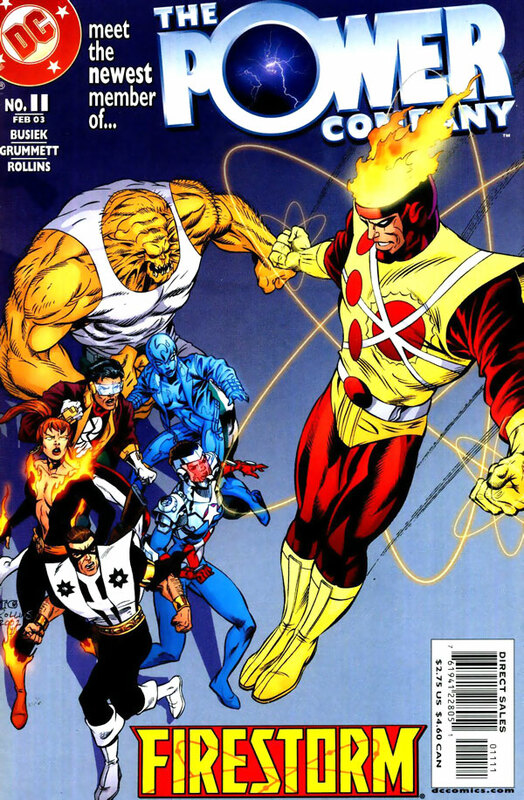 There is an interesting real-world story about Firestorm joining this comic. In an effort to promote some upcoming changes in The Power Company, a promotional campaign was launched entitled “Power Boost”. This campaign included giveaways of art, signed comics, and more. Since one of the upcoming events in the book was a surprise new member for the team, DC launched a poll on their website asking readers who they’d most like to see join the team. The choices were Batgirl, Booster Gold, Firestorm, Superboy, and the Haunted Tank. The poll made it clear that the new member had already been decided, but Busiek and Grummett promised that if someone other than their choice won the poll, the winner would at the very least make a guest-appearance in the pages of The Power Company. The poll received a total of 78,710 votes. Haunted Tank was the winner with 18,585, followed by Firestorm with 17,972, Booster Gold with 15,636, Batgirl with 14,644 and Superboy with 11,873. 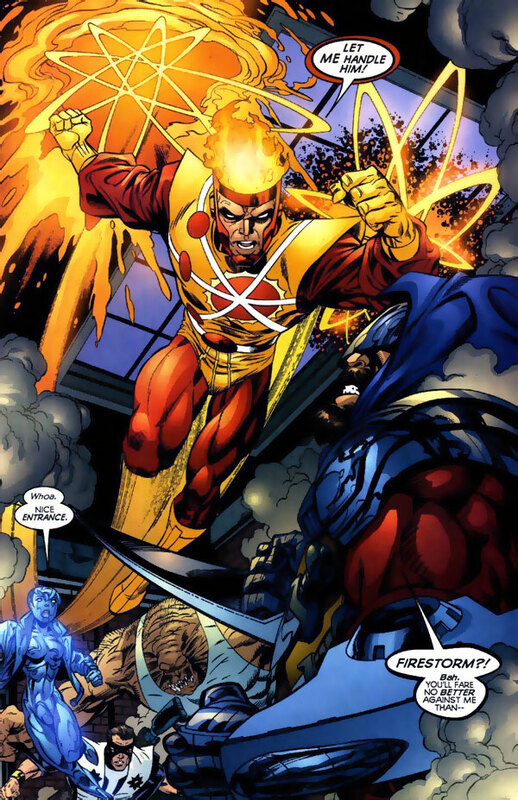 Firestorm was the character Busiek and Grummett had previously decided on as the new addition to the team. In fact, they added Haunted Tank to the poll just for fun. Who would have guessed Haunted Tank would win the poll! So in addition to Firestorm appearing in the series, they honored their promise and found a way to incorporate a modern-day version of the Haunted Tank in the book! My thanks to Comics Continuum for all the details on this poll. So the most important thing to take away from the results of that poll is that Firestorm received more votes than Booster Gold. Isn’t that right, Walter? 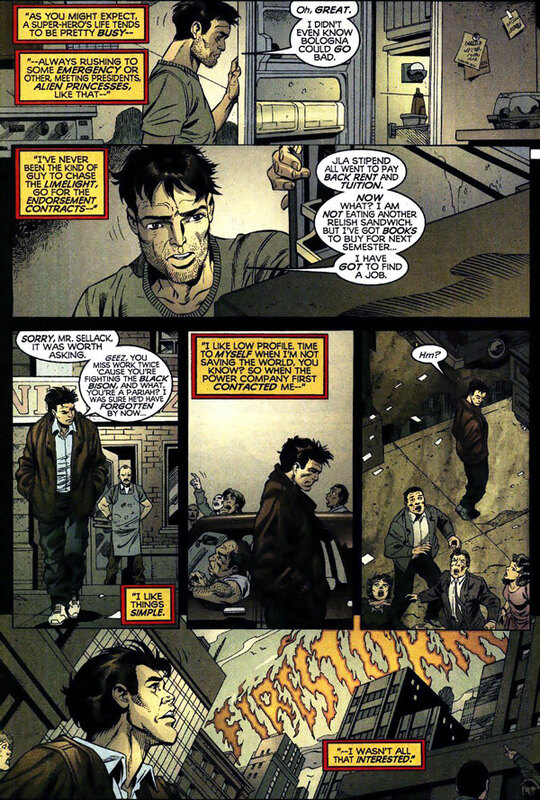 Below you’ll find the final panel from The Power Company #10 (Jan. 2003) by Kurt Busiek, Tom Grummett, and Prentis Rollins. The Power Company #11 (Feb. 2003) by Kurt Busiek, Tom Grummett, and Prentis Rollins picked up the story with our favorite Nuclear Man hogging most of the limelight! Below Firestorm makes a dramatic entrance, helping some Power Company teammates caught in a brawl. Love that Tom Grummett Firestorm!!!! Later during a press conference, The Power Company introduces their newest member! 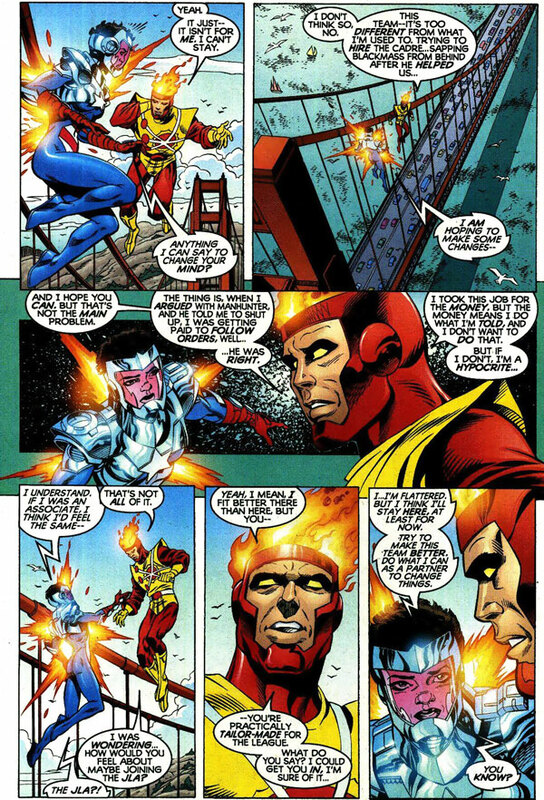 And we see Firestorm’s true reasons for joining the team. 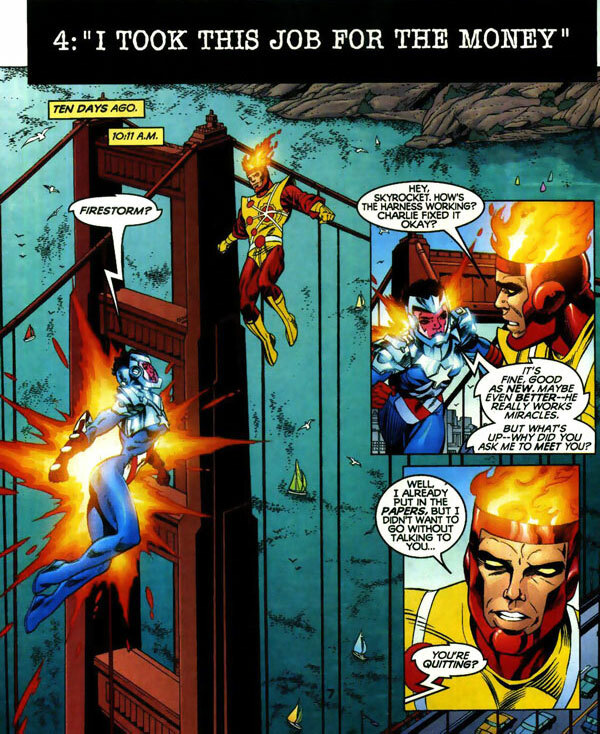 Just a few months later, Firestorm called it quits with The Power Company. I’m not sure what drove the creative decision for Firestorm to leave the team. Perhaps it was because The Power Company was ending in just a few issues. Perhaps it was because at the time DC Comics was planning a new ongoing series for Ronnie Raymond. 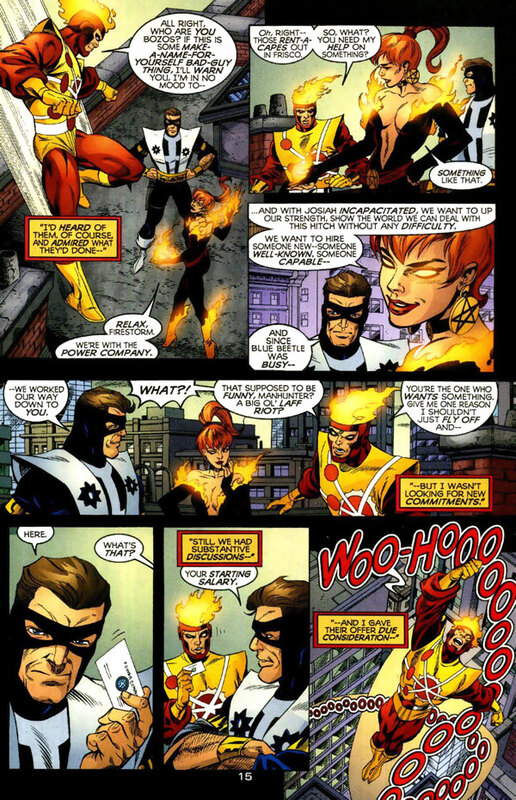 Either way, Firestorm resigned in The Power Company #16 (July 2003) by Kurt Busiek, Tom Grummett, Prentis Rollins, and Al Vey. The Power Company was a great series! If you’ve never read it, check out the back issue bins for these comics. It’s worth your time and money! Posted in: Comic books, Firestorm #05: Ron solo, Power Company. QUOTE: So the most important thing to take away from the results of that poll is that Firestorm received more votes than Booster Gold. @Boosterrific – People who live in glass houses should not throw stones… anyone remember The Conglomerate? Nope, I didn’t think so. The book ended a couple of issues later, so why not free up Firestorm before every one of those characters slipped forever into oblivion. Well, I guess Manhunter was valuable enough to be killed off in the Kate Spencer series. Anyway, I couldn’t get into this book or its characters. I like Tom Grummett and Prentis Rollins, but I don’t think I like the combination of Grummett and Rollins on a book, y’know? Don’t forget that your readers are due a “How Jason Formed a JLA – 2006!” I think you already did that actually, but where’s the link?